1. Introduction: What is Jyotish? The Creation: Vasudeva/Sada Shiva, manifested and un-manifested part of GOD. (Truth or Satya) and (Untruth or Maya) Principle: Shiva and Shakti principle. Jyotish as Vedanga, scope and parts of the knowledge body. Description of lineages of Sages and their contribution in Jyotish. (Brihat Parashara Hora Shastra). 5 Mahabhutas or 5 Building Blocks of creation: Agni, Prithavi, Vayu, Jal, Akasha. Introduction to Panchang, the quality of time. Soul (Atma), Mind (Manas) and Body (Sharira): Sun, Moon, and Lagna. Sapt Loka: 7 Planes of existence, and the real picture of a Horoscope in the Sky. Introduction to Nakshatra (Constellations), Rashi (Signs), Bhava (Houses) and Graha (planets). The depiction of charts in 3 forms: The North Indian style, South Indian style, and East Indian style. The constant reference to puranic stories, events, and descriptions as described in various Vedic scriptures for practical usage in Jyotish. 2. Nava Grahas or Nine Planets: Comprehensive description, significance, and usage: Sun, Moon, Mars, Mercury, Jupiter, Venus, Saturn, Rahu and Ketu. Various kinds of relationships between planets: natural friendship enemy relationships (Naisargik matri-shatruta), compound relationship, finance related friendship and enmity, pachakadi-sambandha etc. The meaning of exaltation, debilitation, mul-trikona, own sign, friendly sign and enemy sign. Graha Drishti, Rashi Drishti, and Argala. Other states of the planets: Baaladi avastha (based on age), Jaagritadi avastha (based on attentiveness and focus on goals) and Sayanadi avastha (based on mood). Evaluation of strength of planets: Various kinds of strengths. Sthir Karaka (Fixed Significance): Lorded by Lord Shiva for transformation or destruction. 5. Twelve Bhavas or Twelve Houses of the zodiac: Comprehensive description of each house and use. Their relevant meanings in various divisional charts. 6. Yog Karakas : Evaluation of malefic, benefic and neutral planets for each Lagna and hence their inclination of giving good and bad results. 7. Various kinds of Lagnas: Lagna, Arudha Lagna, Hora Lagna, Ghatika Lagna, Shri Lagna, Chandra Lagna, Surya Lagna, Prana-pada Lagna, Vardana Lagna etc. 8. Pancha-Anga: Five basic elements of the quality of time: Tithi, Vara, Nakshatra, Karana and Yoga. Complete description and use. Introduction and then repeated use in analyzing charts, finding Muhurta (auspicious time for the beginning of an activity). 9. Constellations or Nakshatra: The adobes or wives of Moon. The Deities (Devatas), symbols, characteristics and various kinds of characterizations to be used in chart analysis as well as to find Muhrata (auspicious time for the beginning of an activity). Introduction to Nakshatras with detail description. 27 Nakshatra scheme : Complete description and use (Nav-tara Chakra, house mapping of 27 Nakshatra in Various House. Description and use of different Nakshatra from Moon and from Lagna). 28 Nakshatra scheme : Complete description and use: SarvatoBhadra Chakra etc. Divisional charts focused extensively are listed below : Calculations and detail usage. Description of Amsha Rulers for all Divisional charts and practical usage. 11. Building block Principles part 1. Judgment of Bhavas (Houses) from 1st House to 12th House Brihat Parashara Hora Shastra (BPHS). 12. Building block Principles part 2. Understanding the standard results given in classis for meaningful interpretation of the chart. They are not the only results possible. The standard results are taught to make one understand how the principles in Jyotish work so that one can do analysis and make interpretations from the dynamics of any individual chart. Good and Bad Yogas (BPHS, and many other classics): Raja Yogas, Dhan yoga, Pravraj Yoga, Pancha Mahapurusha Yoga, Gaj-Kesari Yoga, Saral Yoga, Vimal Yoga, Kema-druma Yoga, Guru Chandal Yoga, Vipreet Rayoga, Kal-Sarpa yoga, Sarpa Yoga, Graha Mallika Yoga. etc. Eight Char Karaka Scheme : Atma, Amatya, Bhratri, Matr, Pitr, Putra, Gnyati and Dara karaka. Contributing planets are from Sun to Rahu. What they mean and how to use them. Seven Char Karaka scheme: Atma, Amatya, Bhratri, Matr, Pitr, Gnyati and Dara karaka. Contributing planets are from Sun to Saturn. Vimshotari Dasha and its variations: Constellation (Nakshatra) based dashas : Calculation and Interpretation. Dashas starting from various references: janma tara, utpanna tara, kshema tara, lagna tara etc. Conditional Vimshotari Dashas: Satabdika dasa, Chaturasiti sama dasha, Dwi-saptati-sama dasha, Shastyhayani dasha, dwadashotri Dash etc Moola dash: for timing curse and such unfortunate events. Rashi Based Dashas to time events: Narayan Dasha and other Rashi based dashas. Calculation and Interpretation. For Rashi chart and other important divisional charts from Mo, Lagna and Arudha Lagna. 18. Ashtak Varga : Comprehensive understanding and dynamic implementation of various techniques to Judge results and time events. Using Ashtak Varga in Rashi chart and other divisional charts. How to do Birth Time Rectification or how to identify the correct time of birth of a native. In-depth study of the Vedanga Jyotish with emphasis on Shastras and teachings of Santana Dharma (Hinduism). The course is designed to teach theoretical concepts and practical case studies for hands-on experience on real charts of people/entities/celebrities. 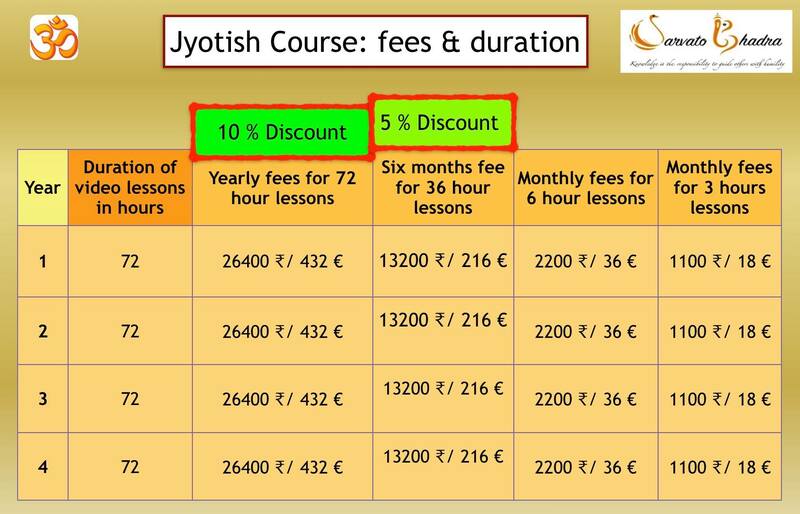 Jyotish video lectures in Hindi/English language are sent to the members via the internet which they can download, watch & learn at their convenience. If they have any questions then they post them in the private groups and the queries are addressed as soon as possible. Complete study material is provided with further references to books and Shastra along with the knowledge base of Sanatana Dharma. Continuous guidance to all students to stay on the correct path and develop their knowledge with less confusion, disappointments and/or failures. WhatsApp and Facebook private group to freely interact with the Guru and other group members, ask questions, discuss and learn in a friendly atmosphere on daily basis. Frequent quizzes and tests are held in the form of: true/false questions, multiple choice questions, full descriptive questions etc, to track the progress and to revise the concepts already taught. The idea is to help students completely digest the knowledge. Constant effort to help members think in the right direction, develop their own analytical ability, problem-solving skills, judgment and give advice, predict and/or provide remedies to help natives. Brilliant and dedicated member in the group to help learn, discuss and share thoughts. Conducive atmosphere to stay motivated for long. Group members are of diverse backgrounds, ages and professions: most/all are working in different fields: corporate, businessman, government, astrology, pundits, others etc. Participants also have access to webinars as and when they are recorded. No restrictions on any student to learn from other Gurus, Jyotish schools or educational organization. If you are learning elsewhere, you can continue to do so freely. Focus on Mantra chanting and other practices of Sanatan Dharma to help participants develop their spirituality and learn Jyotish well. It is a divine science. Participants can choose their rhythm of learning and opt for fees that best suits them. If you would like to learn Jyotish in a methodical way then please contact Gaurav Dave via email (gauravdave.gdave@gmail.com, dave@sarvatobhadra.com), WhatsApp/telephone (0033625750152) stating your interest. Please feel free to contact, should you have any other query in mind.